Toxoplasma, canonical and non-canonical autophagy, plastid. Toxoplasma gondii is a ubiquitous parasitic protozoa that infects up to 30% of the World’s population and causes a disease that, although generally benign, can prove fatal. This is particularly the case for a developing foetus (when the mother becomes infected during pregnancy) or for immunocompromised people. As its mammalian intermediate hosts, this unicellular parasite is a eukaryote, but they are very distant phylogenetically. 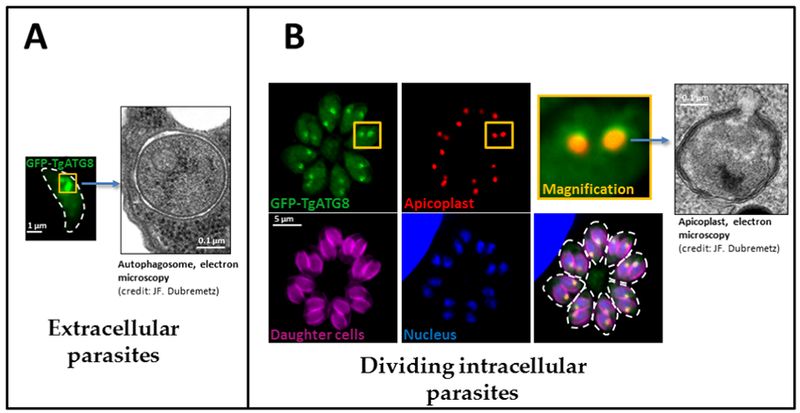 We are focusing on essential cellular processes, which are thus usually conserved among eukaryotes, but bearing enough differences to make them potential therapeutic targets in the parasites. Autophagy is a reparative and life-sustaining process by which cytoplasmic components are sequestered in double-membrane vesicles called autophagosomes, and degraded after fusion with a degradative lysosomal compartment. T. gondii is an obligate intracellular parasite possessing an apparently reduced autophagy machinery. It is nevertheless able to generate vesicles resembling autophagosomes (with double membrane, decorated with TgATG8,…) upon stress such as starvation (A). However, the canonical autophagic pathway is not completely characterised in these parasites as degradation and recycling of autophagosomes has not been clearly demonstrated yet. 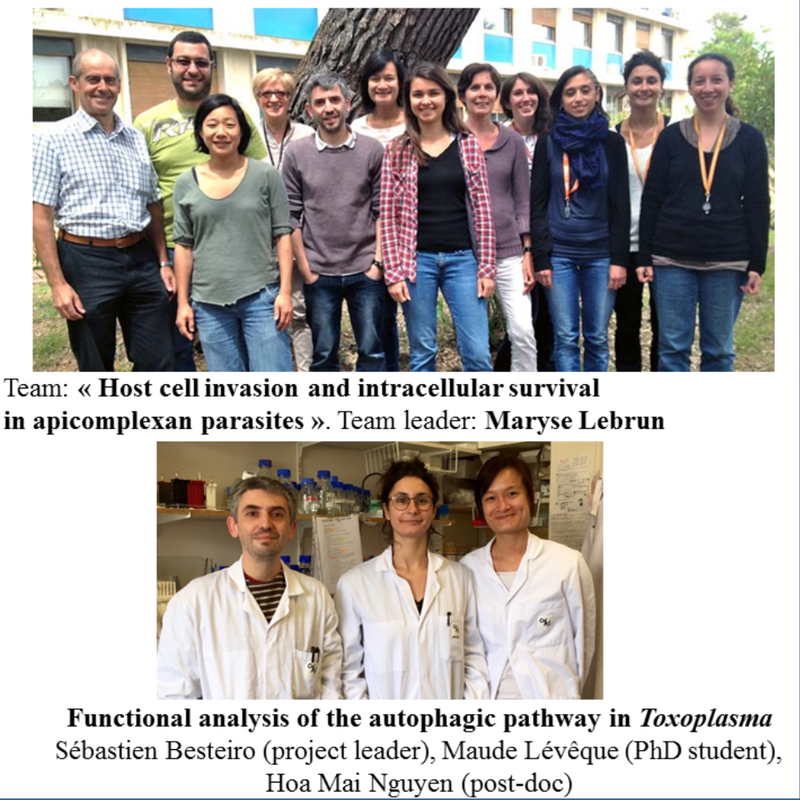 We are currently undertaking the functional characterisation of early players in the autophagy pathway (ie protein TgATG9) to evaluate their involvement in canonical autophagy and the importance of this pathway for the parasites in sustaining stress. We have also recently shown that, in T. gondii, the TgATG8-centered part of the autophagy machinery has been repurposed for an original function in maintaining the homeostasis of an organelle called the apicoplast (B). This is a non-photosynthetic plastid which is essential for the survival of the parasites. As such, it is a privileged target for discovering novel therapeutic strategies. We are thus currently trying to understand why and how this ancient eukaryote has been repurposing part of the autophagy machinery for new original functions which are crucial for its cellular homeostasis. -Autophagy-related protein ATG8 has a noncanonical function for apicoplast inheritance in Toxoplasma gondii .Lévêque MF, Berry L, Cipriano MJ, Nguyen HM, Striepen B, Besteiro S. (MBio. 2015;6(6):e01446-15) doi: 10.1128/mBio.01446-15. Isabelle Vergne a écrit 25 articles.